The car its self uses the stick figure theme car as a base for the moving wheels. The rest is made from numerous stick figure props (for example the door handle is a stick figure mobile phone). If you watch the animation carefully you'll see the movement of the car is all an illusion. It never actually moves from it's position on the screen. It's all done through the movement of the background props and camera pans. It was an idea I got from parallax scrolling computer games of the nineteen eighties and nineties but is actually a very old technique used in films as well as animation. Moving such a complex prop, like this car, which at a guess is made up of more than 50 props would be close to impossible in the Domo studio because you cannot multi-select objects. Everything would have to be moved individually. 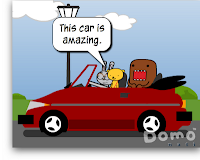 The story line for the animation took me a long time to come up with because I wanted Domo to travel somewhere that would be both funny and seem like he'd been on a road trip. Thank goodness for the picture of Mt. Fuji prop! You've probably noticed I"m something of a Batman fan with two series of animations parodying Batman on GoAnimate (Dorkman and Bat Storm). I noticed Domo Animate had a Bat mask in the Monsters and Supernatural theme which paved the way for Bat Domo. The biggest problem I had with this was the Bat mask. If I actually attached it to Domo it looked too small and didn't line up with his eyes. The only way to solve it was to make the mask bigger and move it separately. This presented some challenges but I worked out that if I moved Domo first and found out where he'd end up in the next frame, I could then place the mask at the point it should end at. Copy that to the previous frame and use it as a guide for moving the mask. Episode 2, Bat Domo and the Vampire Threat, completely drops the Bat Storm premise of Domo dreaming and is a more direct parody of Batman himself. I really wanted to answer the question of how could Domo be Bat Domo with a cave and a Bat mobile... plus a cape!